U.S. Sen. Chuck Schumer speaks about the importance of infrastructure investment on Dec. 12. Long Island Contractors Association’s Executive Director Marc Herbst at Schumer’s immediate right, and ARTBA’s Vice President of Member Services Allison Klein at far left in the image. Senator Chuck Schumer (D-N.Y.), the incoming minority leader, supported by Long Island Contractors’ Association’s Executive Director Marc Herbst and other construction industry advocates, used a Dec. 12 press conference to reinforce the need to move forward quickly with a large infrastructure bill. 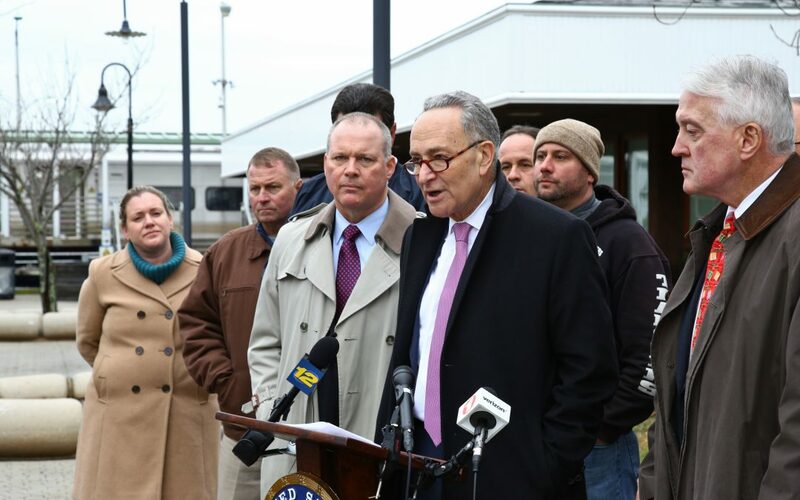 Speaking outside the Long Island Rail Road’s busy Ronkonkoma station, Schumer said that major transportation infrastructure improvements must be done to meet growing commuter needs. Schumer said he wants to work with President-elect Donald Trump to pass an infrastructure bill once the new Congress convenes in January. “We need real expenditures, direct federal investments, not just tax gimmicks to get it done,” he said. ARTBA’s Vice President of Member Services Allison Klein echoed Schumer’s comments and pointed out the need for long-term, sustainable infrastructure spending.